The Internet in Cuba: Cuba needs a domestic upgrade to utilize the ALBA cable. Will China help? Cuba needs a domestic upgrade to utilize the ALBA cable. Will China help? The Cuba-Venezuela undersea cable will soon be operational. In our report on the Cuban Internet, we discussed the cable and China's role in its financing and construction. We mentioned a report stating that the cable had been financed with a Chinese loan to Venezuela, and described the Chinese role in its design and installation. When complete, the cable will increase the speed of Cuba's international connectivity dramatically, but, what of the physical and human infrastructure needed to capitalize on that increase? Cuba's domestic network and the people and organizations that operate it have been working with low-speed, high-latency international connectivity. They are, to a great extent, living in the dial-up access era. To utilize the capacity of the new cable, they will have to upgrade equipment, organizations, and worker skills. If they do not, the cable will be of limited value -- a strong link in a weak chain. The Ministry of Informatics and Communications (MIC) and others in Cuba must have plans and programs for upgrading the physical and organizational Internet infrastructure. For example, we discussed Cuban computer science education in our report, with some focus on the relatively new University of Informatics Science (UCI). UCI places major emphasis on practical work along with education -- I expect (hope) that they are involved in both training for and implementing a strategic upgrade of the domestic network. In January 2011, MIC was reorganized and later in the month Cuba purchased Telecom Italia's 27 percent share of ETECSA. These moves may indicate a strategic shift toward support of a new domestic network. But, what of the funding? It was reported that it cost $706 million to buy Telecom Italia out. Those funds are no longer available for domestic network upgrades, but might China play a role in modernizing Cuba's domestic Internet? 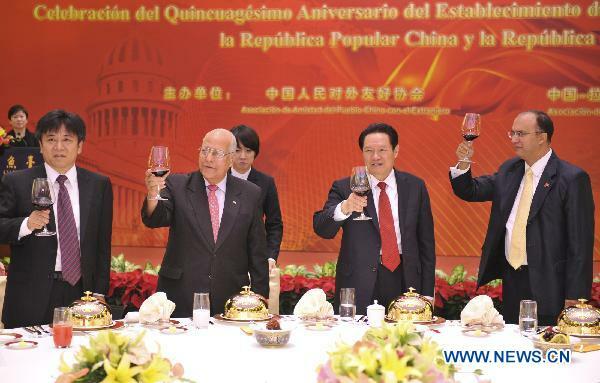 Cuba was the first Latin American nation to establish diplomatic relations with China in 1960. At a fifty-year commemoration ceremony, the Chinese pledged to "provide assistance to Cuba to help its social and economic development." Like the US before it, China has made many investments in developing nations, and they have already participated in the undersea cable project. China has extensive experience building Internet infrastructure at home and to a lesser extent in Africa and other parts of the world. Furthermore, Huawei, a Chinese company, has emerged as a major manufacturer and exporter of Internet equipment. How will Cuba upgrade its physical and organizational infrastructure to take advantage of the new undersea cable and what will be China's role in developing the domestic Internet in Cuba? Is there a Cuban IT plan? My speculation on China should be qualified by the fact that according to a Wikileaked diplomatic memo Cuba-China trade volume fell with the current economic crisis and China is somewhat disillusioned with Cuban finance. There has been speculation that Cuba is looking for a new foreign partner, perhaps to finance new domestic infrastructure. I got some information regarding the plans for the new internet infrastructure, and it seems the MIC is going to prioritize the existing (and currently disabled) GPRS connectivity of the mobile phones network while they find the necessary funds for major improvements on cable connectivity. This is just a rumour though. However, there is a already a national fibre cable that goes along the whole country, it was built many years before the undersea cable. Many nodes has been spread along government-ruled buildings in main cities like Havana and Santiago. They have been underutilized for many years, since there was not enough bandwidth available from/to outside the country. By the way, I would like to clarify something regarding your report on Internet Access in Cuba. You cannot trust any data provided by the Cuban government on this subject, since they count access to the national "intranet" network as accessing internet, which is obviously not the case. For example, "Youth Computer Clubs" do not have access to internet in general, I only know 2 of them that do have, in whole Havana City, and they only have 4-5 computers. I do not think does numbers are relevant. However most of these clubs have access to the national network, so the "cheating" is there. The Cuban government really loves cheating with statistics, one of the must famous cases is the value of the Cuban currencies. We have a "Cuban Convertible Peso", equivalent to the US dollar, and a "Cuban Peso", which is exchanged internally at a rate of 26 CUP = 1 USD. However during many years, for UN statistics purposes, the goverment considered only one currency with a rate of 1x1 with the US dollar. Naturally, salaries are paid in the less valued currency. Also, I heard a rumour that ETECSA is going to use GPRS from the mobile phones network for internet connectivity until they can do the necesary investments for cable connections. However, there is a national fibre-optic cable that was installed a few years ago along the center of the whole country, long before the undersea cable to Venezuela, and there are also a few fibre nodes distributed among some government buildings and universities in main cities like Havana and Santiago. This infrastrucutre has been underutilised for many years due to the lack of bandwith from/to outside the country. Thanks for the link. It sounds like there may be disagreement. The article quotes ex-minister of MIC, José Luis Rodríguez as saying that Telecom is a strategic sector to national security, in addition to being very profitable. On the other hand, in the article I linked to, Deputy Minister Jorge Luis Perdomo said “We’re still deciding whether Cuba should stay with the share, or whether we should sell it to a foreign operator,” in response to a reporter's question at during a press at Informática. Does that signal internal debate or is the later version (no new investor) the decision? I do not know how Cuban politics works, but I hope there are foreign or domestic funds and plans for domestic infrastructure. For my report, I was able to interview (via email) an anonymous user in Cuba who confirms what you say. He told me that international email and international Web surfing are blocked at the YCCs (Table 6 in the report). I think this sort of data from users in Cuba is very interesting and am planning to do a post on surveys when I get time this weekend. What is the best way to get input from people in Cuba? PS -- I received an automatic email saying another comment was deleted by mistake, but it is not reposted. As far as I know, domestic infrastructure was included in Alcatel agreement. Maybe the Chinese are included too, nobody knows. But, as Alvarez clearly said, for Cuban goverment Internet is a national Security matter, so no foreign partner is invited by the moment. Cuban state company Rafin S.A. (an entity to finance import-export operations, participate in debt refinancing operations, and manage centralized funds for state companies, among others, considered the non-bank financial branch of Grupo de Administración Empresarial S.A. (Gaesa), the armed forces’ business unit) was who bought Telecom Italia’s 27-percent share in ETECSA. Six Cuban state entities now own ETECSA — Telefónica Antillana S.A. (51.006%), Rafin S.A. (27.003%), Banco Financiero Internacional S.A. (6.157%), Universal Trade & Management Corporation S.A. (11.086%), Banco Internacional de Comercio S.A. (0.923%), and Negocios en Telecomunicaciones S.A. (3.825%). The control of the growing and undoubtly profitable mobile phone business—and all the Cuban telephone lines—is now complete. It's always interesting to see these comments that completely remove context from a technical discussion, applying any barriers to the "desire for control" of the Cuban government. At last count, Cuba had over 900 community Joven Clubs nationwide (this was the topic of my months-long fieldwork in Cuba in 1999/2000, and I have kept abreast of developments in this sector). From a national development perspective, given Cuba's limited (and expensive) satellite connections to the global internet, the government has taken exactly the right policy decision in restricting access to the national network, prioritizing extra-island access to those sectors with a legitimate need (and that does not include whiners like Y. Sánchez). Cuba has enough economic challenges to face - diverting scarce resources to ensure Cubans can update their facebook photo albums would be a developmental error. Once the connectivity issue is more or less addressed with the Caribbean fibre optic link, we'll have another discussion on policy. But to this point, I can't find fault with Cuba's general IT policy regarding internet access. There is not "right" to internet. Not having internet is not a violation of one's "human rights", no matter how often it is portrayed that way. > Maybe the Chinese are included too, nobody knows. You and I don't know, but someone must. You don't do a $70 million cable project without a plan. > Alvarez clearly said, for Cuban government Internet is a national Security matter, so no foreign partner is invited by the moment. What do you make of the remark by Perdomo? Is there internal debate on this or has the issue been settled? I don't understand Cuban economic organizations -- what is meant by a "state entity" that is also an "S. A." like ETECSA or Rafin? Do profits go into the general treasury? Do losses come out of the general treasury? Where does investment capital come from? Who is responsible for debts in case of bankruptcy? Are the managers civil servants? Is there the equivalent of the board of directors that hires managers and sets policy? What is the difference between these organizations and a US corporation or a government department? (I am not asking these questions rhetorically -- I really don't know). They reported 607 YCCs, 138 outside of main towns and 39 in mountainous regions in 2009. > (this was the topic of my months-long fieldwork in Cuba in 1999/2000, and I have kept abreast of developments in this sector). Have you written reports or articles we can read? Obviously not -- there is no need to be sarcastic. But, even with their international link limitations, Cuba could have decided to provide more intra-national access and connectivity. My feeling is that not doing so was motivated by a combination of economic and political factors -- not all one or all the other. > Once the connectivity issue is more or less addressed with the Caribbean fibre optic link, we'll have another discussion on policy. On this we agree 100% -- that was the point I was trying to make in the post. Hi, I wrote this comment before but it seems I deleted it by mistake. Cuba has a national fibre-optic cable going along the whole country, with some distributed links in main cities like Havana and Santiago. This cable was built many years ago (2002-2003 if I remember correctly), and it has been underutilised since then, due to the lack of external bandwidth. Regarding the new infrastructure, I heard some rumours that ETECSA is planning to use GPRS technology (currently disabled or allowed to very few individuals) with the current wireless mobile phone network, until they can do the necessary cable installations. But this is just a rumour though. Zacaman, not having any way of domestic access to internet is a huge mistake, from many points of view. Universities in Cuba are currently graduating thousands of specialists in Computer Science, and most of them are migrating to other countries for many reasons, being professional frustration a very strong one. From those who graduated in the same year I did, around 9 years ago, less than 10% remain in the country. The goverment created new university programs and built many schools for Computer Science hoping that it would make a difference in the Cuban economy as it did for example in India, but they still do not understand that they will be wasting time and money if they do not open the access to internet at the same time. > Cuba has a national fibre-optic cable going along the whole country, with some distributed links in main cities like Havana and Santiago. It would be interesting to see a description of the fiber network, but that is probably not available. When I was working on my report, I ran a few ping timing tests to various servers in Cuba -- ones at places like InfoMed and MIC, which I assume would have fiber connections. After accounting for satellite delay, they still seemed slow, but there could be many explanations for that. It will be interesting to see how much improvement we see in ping times with the new cable. In the mean time, if you are in Cuba and have international connectivity, ping www.google.com (74.125.224.177) and email the results to me along with a description of your location (for example, "at a university" or "at work" and your province) and I will post a summary of the data. That not exactly a leap into the future :-). PS -- send ping results to lpress at csudh.edu. I am not in Cuba right now, I will go back in a few months. However, even if I was in Cuba, your request is a bit difficult to fulfill. Most of cubans with internet access are forced to use a proxy conection, with http access (port 80) only. Only network administrators or foraingers (and not all) are allowed full internet access. If you know of any tool similiar to ping that can be used with a proxy conection, I might speak with a friend to get you the data. Do profits go into the general treasury? In theory, no, but ETECSA needs a permission from MIC minister to access any funds beyond those that are assigned to them at the begining of each year, and the Minister can take part of these funds and use them for whatever is needed. Do losses come out of the general treasury? Where does investment capital come from? general treasury, income and foraing investments. Who is responsible for debts in case of bankruptcy? There is no such think as bankruptcy in socialism. Are the managers civil servants? Not always... but recently (after Raul took power) there is a tendency to use former army officials as managers. Is there the equivalent of the board of directors that hires managers and sets policy? Oh no! that sounds too much as democracy, managers are decided either by the Minister or by the Presindent if the company or "state entity" is too important. What is the difference between these organizations and a US corporation or a government department? This one is too much for me... But I can say that there are many "state entities" that do not work as a company at all, for example research centers. > Most of cubans with internet access are forced to use a proxy conection, with http access (port 80) only. Are they allowed to run Java applets? >Are they allowed to run Java applets? Yes, I think there are no restrictions on this matter. > Yes, I think there are no restrictions on this matter. Would this network speed test work in that case? It provides more information than ping but it requires java. If they can run it from within Cuba.